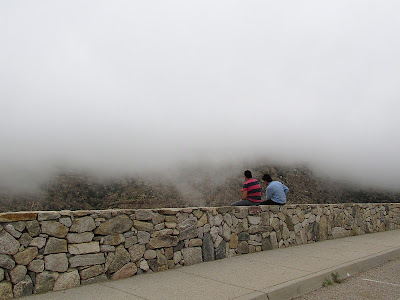 As mentioned in the Round Robin entry I just posted below, last weekend I took Dad for a drive and ended up on Mount Lemmon, as usual. Only this wasn't the usual views in the usual places. 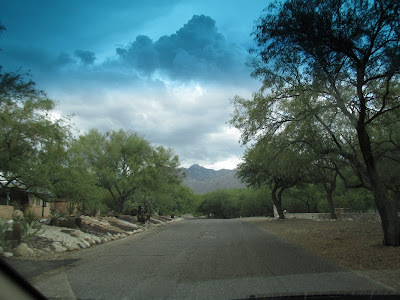 It's monsoon time in the Old Pueblo, Tucson's rainy season. 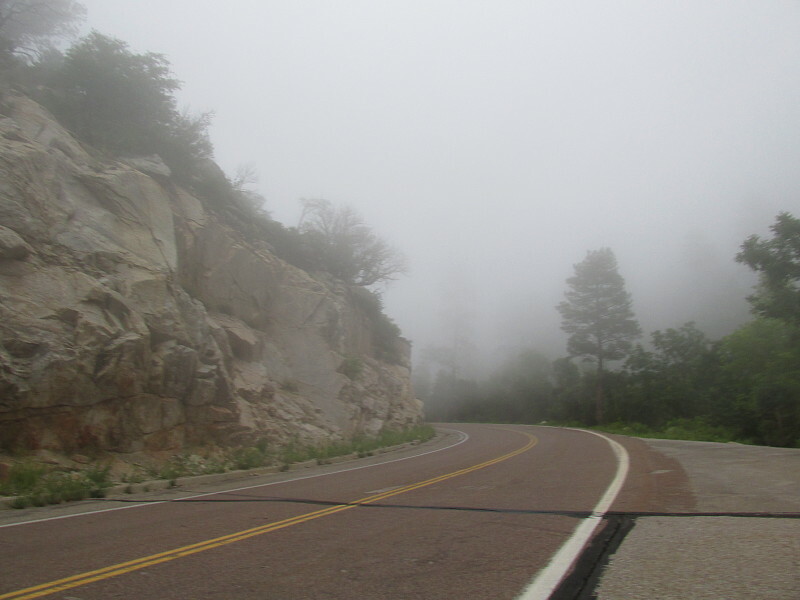 Last Saturday I had the perfect opportunity to get a close-up look at the clouds that cover parts of Mount Lemmon on wet July afternoons. Near Seven Cataracts Vista, or maybe Thimble Peak Vista. It's one thing to sit and watch the clouds roll by overhead. It's quite another to watch them roll by right in front of you. Yes, the fog/cloud was really like that. Near Middle Bear the cloud was actually obscuring the road a little bit. For this week's Round Robin Photo Challenge: Someplace I've Never Been, I asked to see photos of someplace you've never been, whether it's a new restaurant half a block away or a whole new continent. (That's not exactly what I said, but you get the drift.) My inspiration is this: I've been going on long drives with my Dad, and exploring museums with him, sometimes on the same day. The idea is to try to keep his mind engaged with new experiences, and mine too. So where did I find to go last weekend that I'd never been before? Well, here. I know it doesn't look like much; it's just an obscure little restaurant called Seoul Kitchen in a strip mall called Crossroads Festival, which sounds more festive than the shopping center deserves. I was looking for someplace different to take Dad, preferably something that would also work for RRPC. I'd seen the name of this Korean restaurant while driving by. 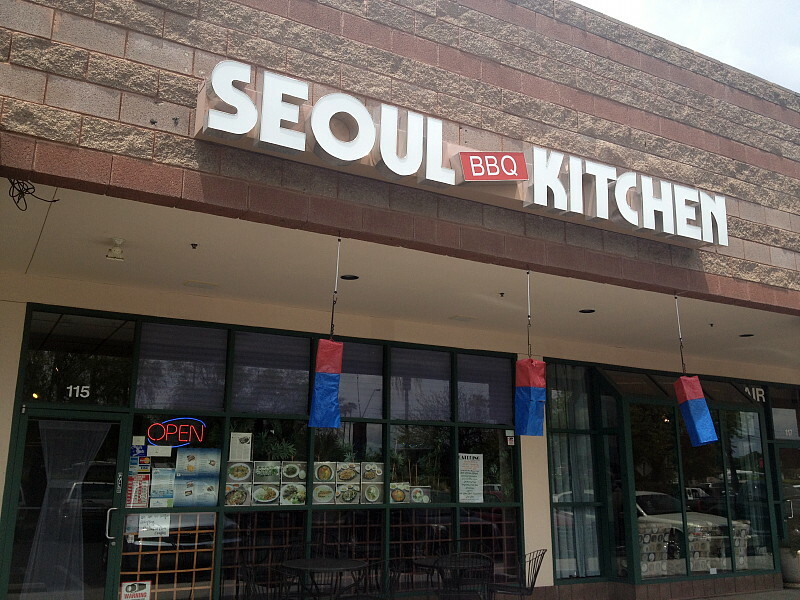 Seoul Kitchen! Cute name! But when I initially chose it over Smashburger (what an exciting name for a burger joint! ), parked and went up to the door with Dad and his walker, I almost chickened out on going in. My tastes in food are not very adventurous, and I got pretty nervous when the posted menu items had names like Spicy Squid, Bi Bim Bap and Mandu Guk. Furthermore, I was not at all sure my dad could handle such choices; he barely copes with a menu in a familiar American chain restaurant. But he surprised me, pointing at menu items that had relatively familiar names and ingredients. "I think it's all right," he said, or words to that effect. Thus he very nicely shamed me into trying the place after all. Having taken the plunge, I looked the menu over and actually went with an entree with a delightfully exotic name: Bi Bim Bap. This was a rice bowl with a little shredded beef, nicely crisp mung bean sprouts and other veggies, and a fried egg on top. I was a little disappointed there wasn't more meat, but that was my fault for choosing Bi Bim Bap over some of the meatier items. Dad had chicken with Yakisoba noodles, which is to say that he ate the chicken and left most of the noodles. That's exactly what he does with all pasta dishes, so I wasn't a bit surprised. The neat thing about the meal was the extras. We started with miso soup, which was minimalist but nicely low carb. Then with the meal we had individual dishes of marinated veggies as seen above. 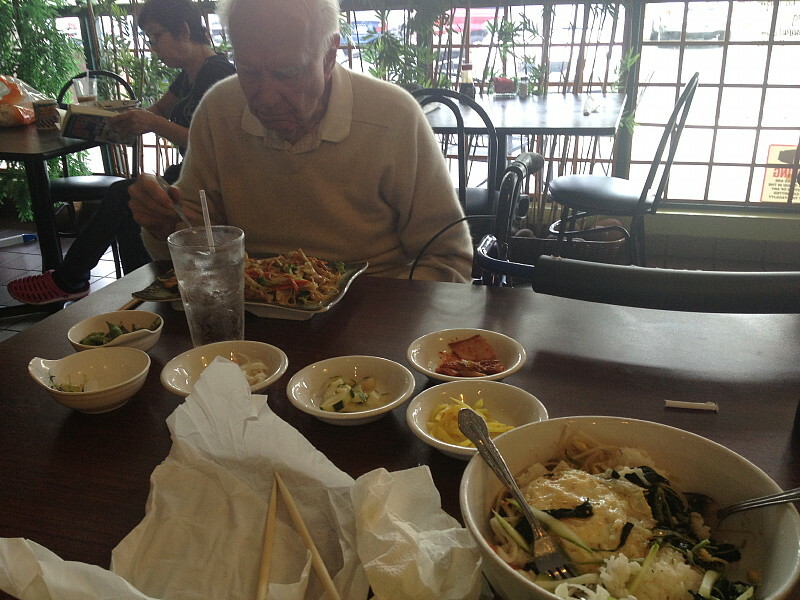 I liked the cucumbers, and Dad actually liked the kimchi, which turned out to be fermented cabbage. That was a little too spicy for me, but Dad ate most of it. The service was excellent and the prices were right, so overall it was a successful adventure in going "somewhere I have never traveled, gladly beyond." After lunch we went to the Ft. Lowell Museum at Ft. Lowell Park. I'd certainly been to the park before and photographed the ruins somewhat extensively, but I'd never been inside the actual museum. 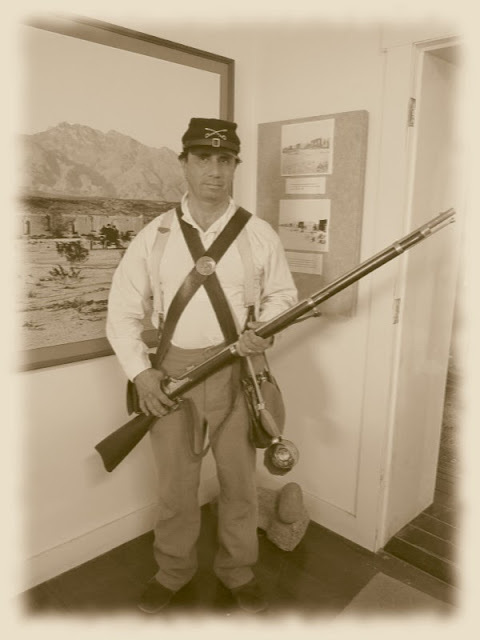 It turned out to be a total bust in terms of interesting Dad in its people or contents, but I enjoyed photographing a docent who wore period clothing and demonstrated how to load a period rifle. Another docent was also connected with the Pima Air and Space Museum, which Dad and I had visited the week before. 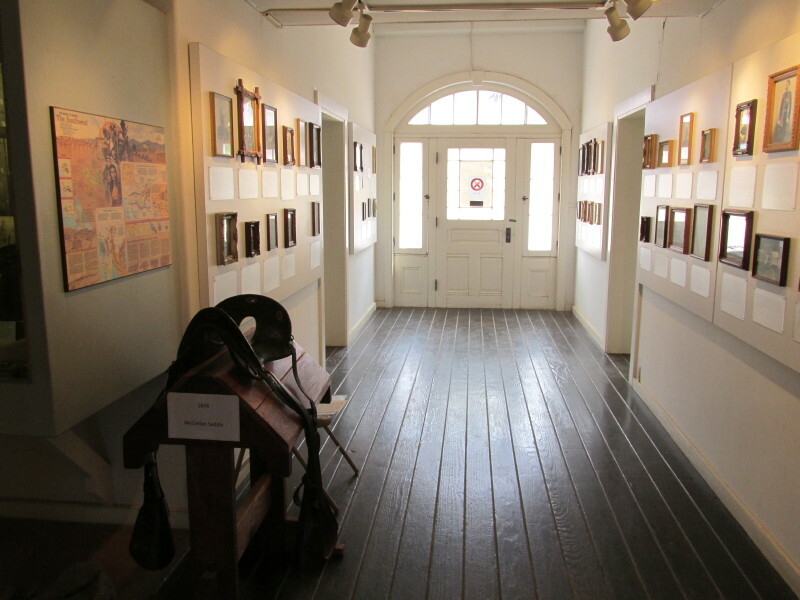 The part of it devoted to World War II is currently closed for expansion and renovation, but that was the area of this docent's particular interest. He was very interested in my Dad's history as a B-17 navigator and Stalag Luft 1 POW, which, by the way, my dad no longer remembers at all. 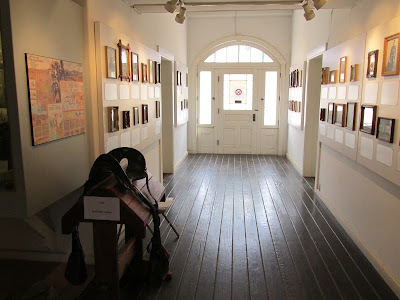 I gave the docent Dad's particulars and my contact info. He promised to do some research and get in touch. After that we went for a drive, as the monsoon got ready to start monsooning. I went looking for a back way to Mount Lemmon, and found myself on a section of Snyder Road that is definitely "Not a Through Street." Kind of pretty, though! 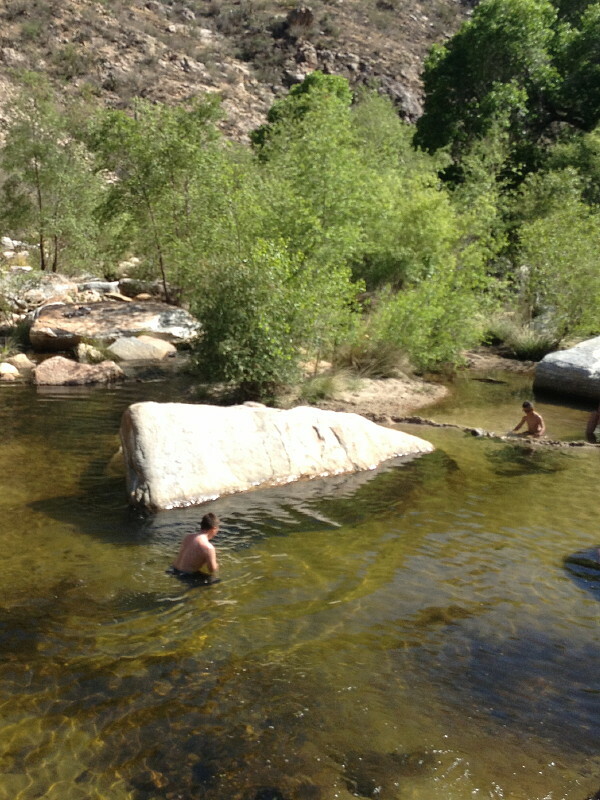 Eventually we made it by all-too familiar route to Catalina Highway. I took one more detour, onto a road less traveled, by me at least. But I'm not quite certain that I've never traveled it. 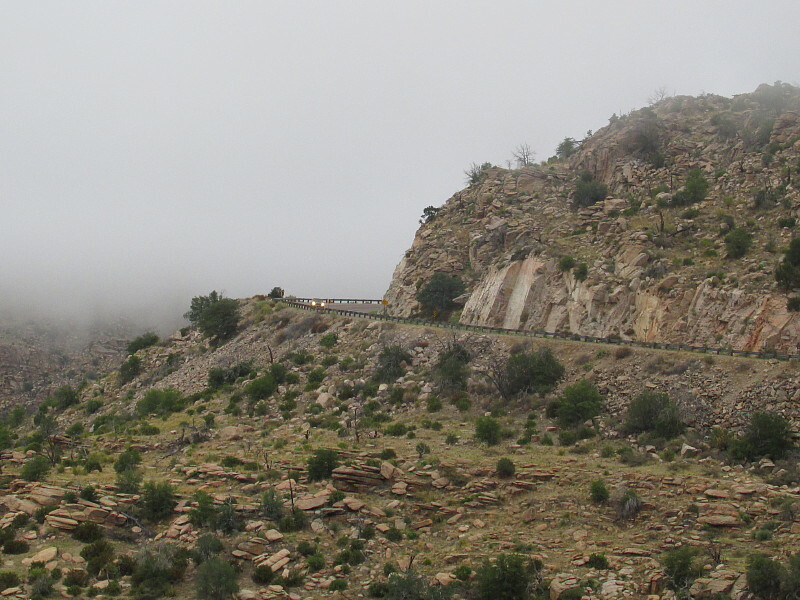 After that I couldn't resist driving up Mount Lemmon, a place I go all the time. But it doesn't usually look like it did that day! I brought back lots of pictures from that, some of them quite striking, I hope. But they definitely don't fit the "somewhere I've never been" criterion, so I'll post some of those in a separate entry. Meanwhile, let's see what new places our other Robins photographed! 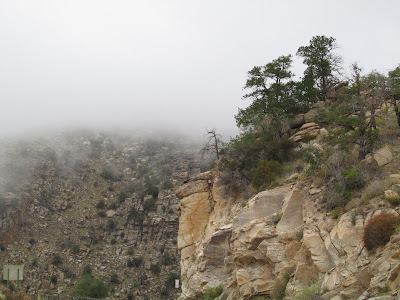 When I posted the topic for this week's Round Robin Challenge: Get Wet!, I was frankly hoping that sometime during these past two weeks there would be an awesome monsoon storm here in Tucson that I could catch people and/or dogs getting wet in. But most of the rain so far this season has happened at night, often when I'm asleep. Usually there are lots of little storms in the late afternoon, but the few daytime ones I've seen recently, aside from the first one (which I forgot to photograph), have been, well, less than awesome. So it's on to Plan B, right? The main reason I've known about the nighttime storms is that I come out in the morning and there are spots all over the car. Clearly the car has been getting wet - just enough to get dirtier instead of cleaner. I've had the car washed twice in two weeks, but look at the driver's side window as of this evening. 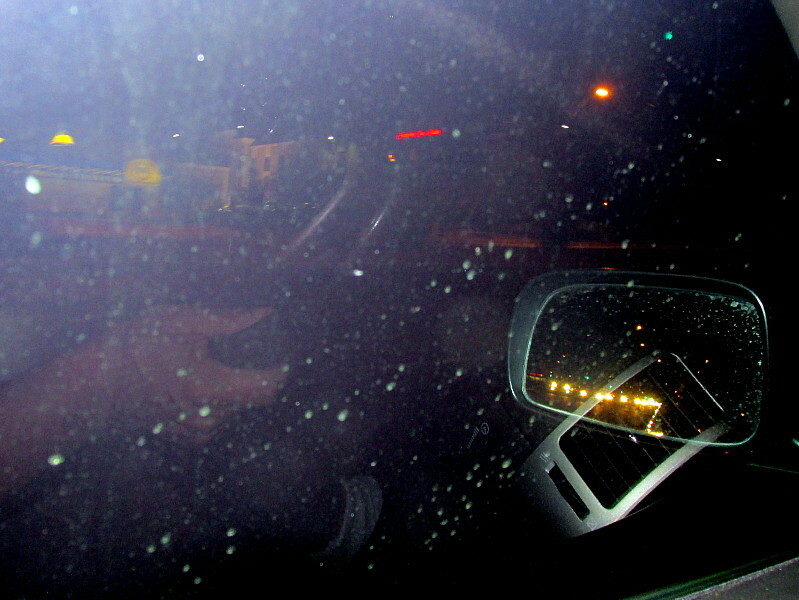 All the dust in the air gets on the car, and the rain turns the dust into dried-on dirt drops. 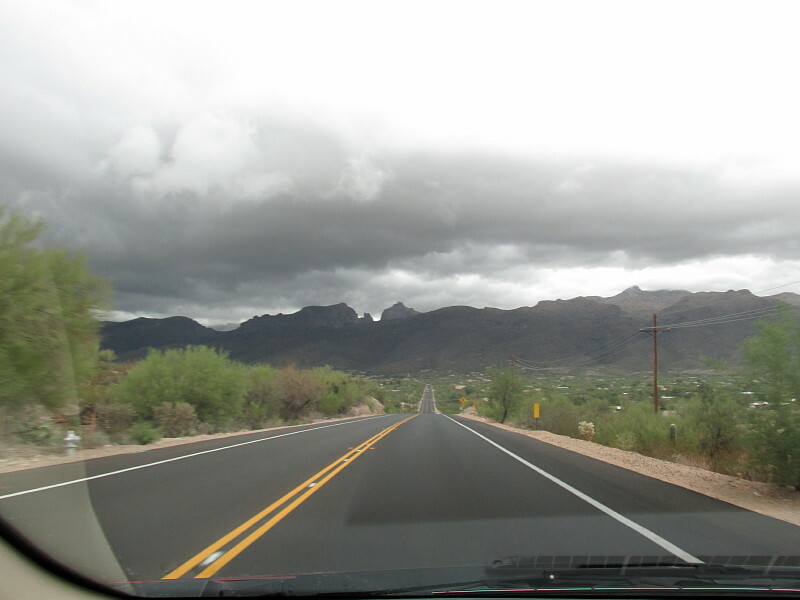 Okay, so I have no great monsoon pictures yet for this year. But on the Fourth of July I started the day with a walk with the dogs down to the nearest part of the Boneyard, where the retired aircraft are. I carried a collapsible mini bowl for the dogs' water, and filled it at a water fountain under a ramada (a sort of canopy, in this case over a couple of concrete picnic tables). 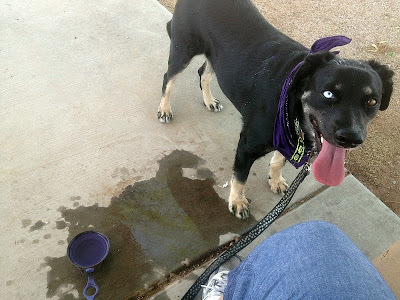 Kito drank two bowls of water almost by himself, and then got the concrete slab under the ramada more than a little wet by knocking over the bowl. Cute, but not impressive. Clearly I'm going to have to go to the archives to get something decent here! Back in April I took my Dad on a tram ride up Sabino Canyon. 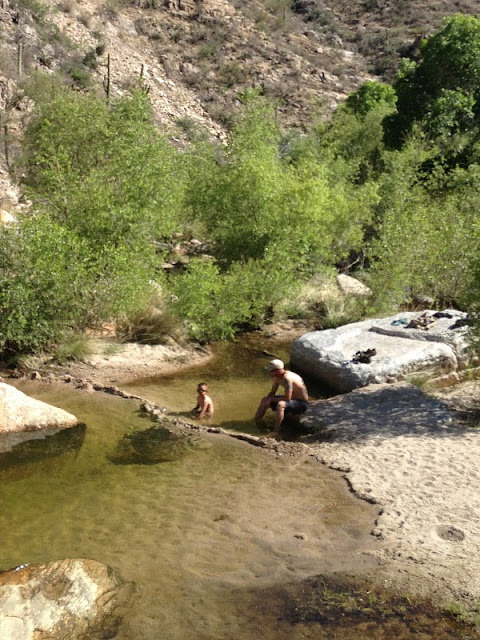 It was already hot enough that people were cooling off by getting wet in Sabino Creek, the closest thing we have to a beach around here. Now let's see what other Robins found that was getting wet!